These buttery, sweet melt-in-your-mouth treats will take you to Paris without having to leave your home. 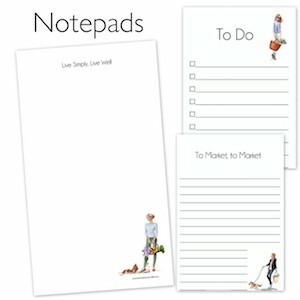 Paired with a cup of hot tea or cafe au lait, these delicate simple luxuries will please adults and kids both. Needless to say, over this past weekend, my sweet tooth craving was more than satiated. Sweet dreams indeed! Prior to my baking class at Sur La Table last month, my experience with palmiers was not pleasant. As my first memory was from a plastic bag that most likely sat on the shelf for months, the sticky, hard cookie was not worth the calories, money or effort. Thankfully, that is not what palmiers are supposed to taste like. 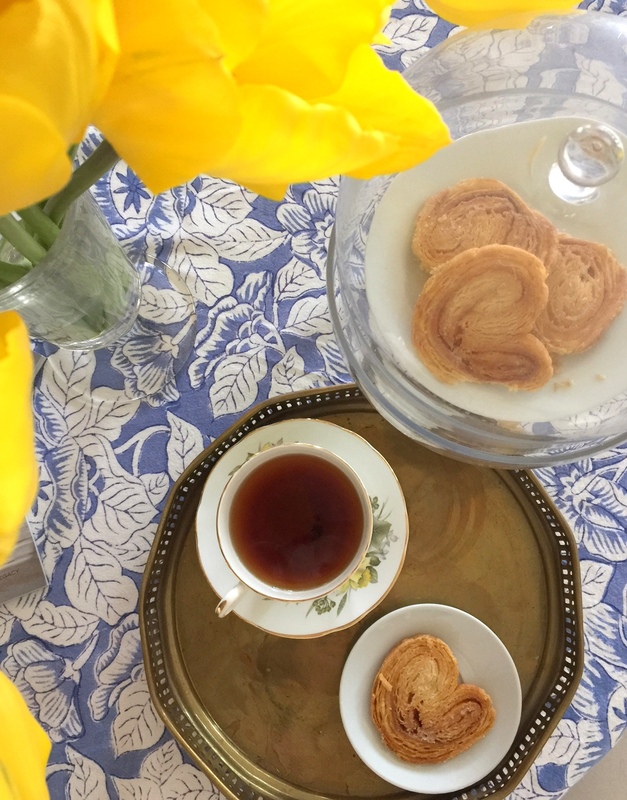 Emelia Hall, the Parisian Boulangerie instructor at Sur La Table, shared a list of French recipes that can be done at home, and one of them was sweet or savory palmiers (click here to see all of Sur La Table cooking class offerings). In French, palmier translates into palm due to their resemblance to a palm frond. They are also called elephant ears or butterfly wings. And the fact that they resemble a heart is a lovely aesthetic detail as well. Enjoy this simple, but decadently delicious sweet French treat. Cut cold butter into 3/4 inch cubes. Transfer to the bowl of a stand mixer or a mixing bowl. Add the flour and salt, toss with your hands until the butter is coated. Chill the bowl in the refrigerator for 20 minutes. Combine the water and vinegar and refrigerator for 20 minutes as well. With the mixer or food processor on low, slowly add the water-vinegar mixture, drizzling it in at different points around the bowl. In about 10 seconds, the dough will begin to come together in large chunks and feel slightly moist, but it will not look smooth or finished. 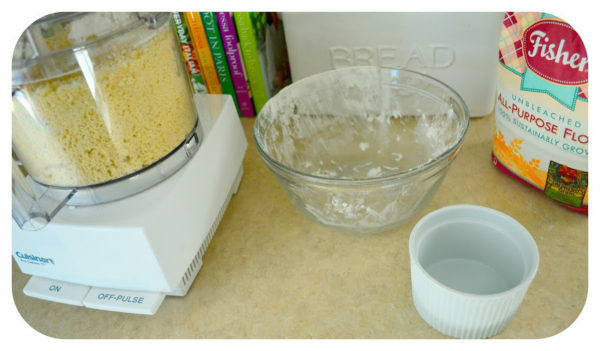 Turn the dough and any dry bits at the bottom onto a work surface that has been dusted with flour (I used a pastry frame which is much less sticky and allows for easy clean-up – shop "kitchen" in TSLL Shop to find the one I recommend). Shape the dough into a rough rectangle about 6 by 8 inches and about 1-1/2 inches thick. Dust the top with flour and roll the dough into a 14 by 16 inch rectangle. 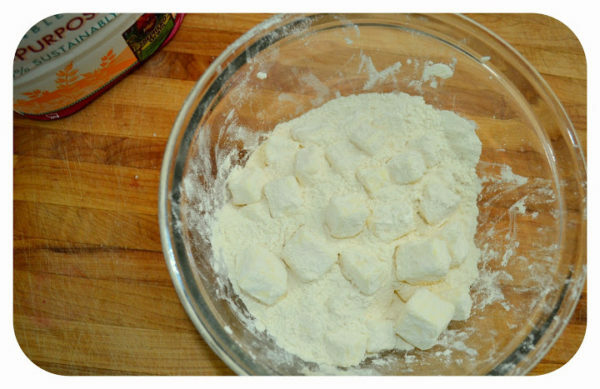 Brush any flour from the surface of the dough. 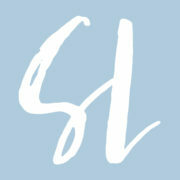 Make a letter fold (3 total layers after folding – see my example below). Brush off any excess flour as you fold. It will look shaggy – this is completely acceptable and expected. 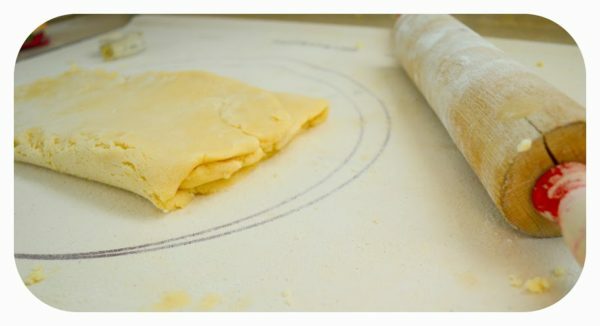 Roll your pin across the top of the dough briefly and gently one or two times, just to fuse the dough. Wrap in plastic and refrigerate for 30 minutes. After the first 30 minutes, take out and roll out again to 14 x 16 inches and make the letter fold. Place back in the refrigerator for 30 minutes. *You can do this entire process ahead of time and keep the dough in the fridge up to 48 hours. Generously dust your work surface with sugar. 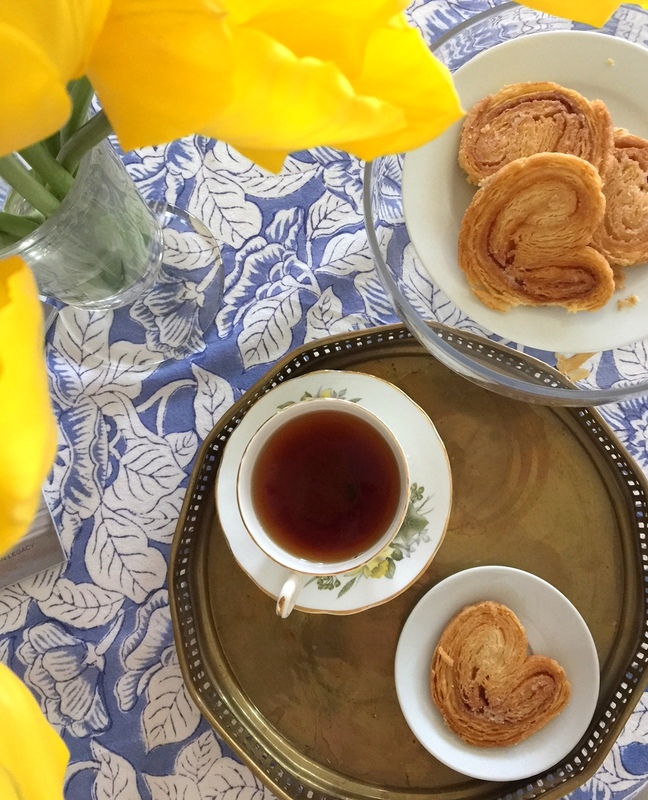 Place the dough in the center and sprinkle the top with one cup sugar (if making savory palmiers, add the savory ingredient just before you fold into the heart shape), covering it completely. 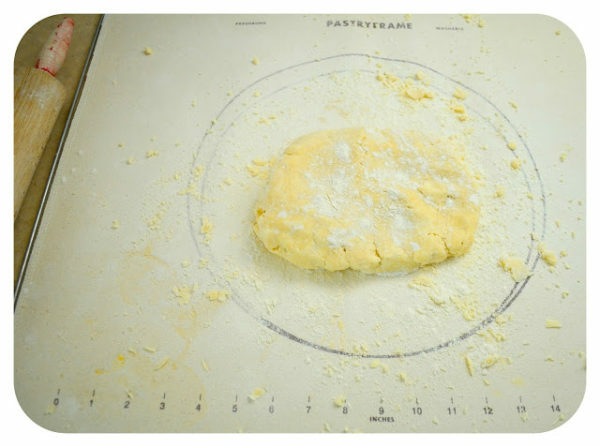 Roll into a 16 by 10-inch rectangle, using additional sugar as needed to keep the dough from sticking to the surface. Make a book fold (four layers). Using a ruler and the back of a knife, mark a line dividing the dough in half length-wise, each half measuring 8 x 10 inches. Using the ruler and knife again, mark each half into quarters. Fold the two short edges to the quarter mark and fold over again until you are 1/4 of an inch away from the center (do this on both sides). Tighten each side to leave 1/4 inch space down the center of the dough. 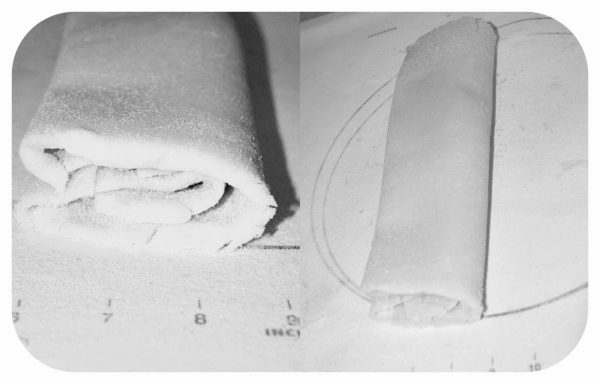 Fold one side on top of the other, forming a 10-inch long cylinder. If you look at the end of the cylinder, you’ll see the shape of a heart. Wrap in plastic and refrigerate for 30 minutes. Bake the cookies for 7-10 minutes, or until golden at the edges. With a spatula, flip each cookie over. Return to the over and bake for 9-12 minutes longer, until they are a beautiful golden brown. Transfer to a rack and cool completely. *Will keep for two weeks in an airtight container at room temperature. Oh wowwww! These look SCRUMPTIOUS! What an incredible sweet treat! I fear I’m not skilled enough in the kitchen to replicate this recipe, but I certainly wouldn’t turn one down, haha! I’ve baked them before and they are such a delicious treat. Great post! Chocolate or cinnamon also work very well as a filling. I am sooo making them next week in Barcelona. Oh yum and I can tell they melt in your mouth! 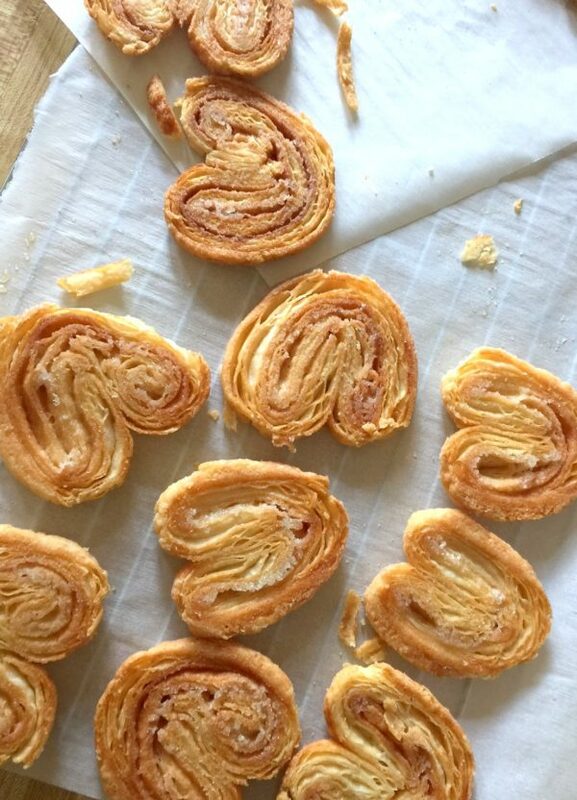 how many palmiers does this recipe make? 12-16, depending upon how thick you slice them. They are delicious! Enjoy!